"No! No! I won't go there!" seven-year-old Trixie Chatham cries out. "The Ship Cottage is haunted!" Prompted by her concern for the frightened child, Nancy investigates the small studio on the Chatham estate. What the astute young detective discovers leads her to believe that there is a connection between the mysterious occurrences at Ship Cottage and her search for a treasure island. 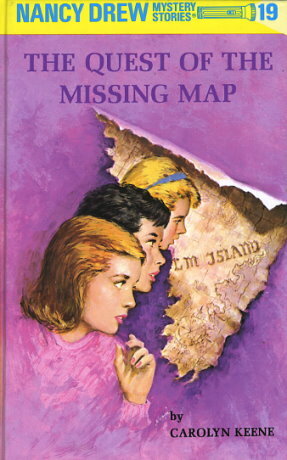 With only a few slim clues to guide her -- a half map and Tomlin Smith's vague memories -- Nancy sets out to find Mr. Smith's long-lost twin brother, who possesses the rest of the map that will pinpoint the location of buried treasure willed to them by their father. Constantly beset by danger and intrigue, Nancy courageously outwits her enemies and solves one of the most challenging cases in her career as a teen-age investigator.